Get creative and expand your techniques for scrapbooking, cardmaking and all paper crafting applications when using this foil as a base sheet accent piece.This mirror-like foil is shiny enough to see your face in its surface and strong enough to make a large scrapbooking page. Other uses include business cards, invitations, table tents and wall art. Although this 12 x 12 gold cardstock may be fine for some projects, you may wish to have it cut, perforated or scored for other projects. When the need arises, you can count on The Paper Mill Store to provide top-notch paper finishing services. To preserve its gleaming mirror card stock finish and preserve the paper’s integrity, we recommend professional finishing for most projects of this nature. 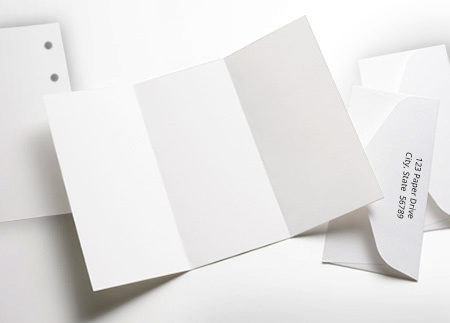 Due to special handling requirements, our expertise ensures your paper order arrives in great condition. JAZZ® Mirror Finish Covers are easy to print on when following these simple hints. We recommend you pre-test all procedures prior to press time to ensure you achieve the desired results. 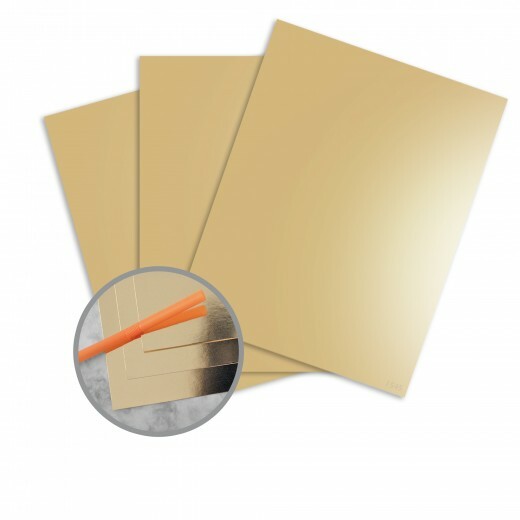 JAZZ® Mirror Finish Covers are sealed with a clear overprint varnish and therefore have a totally nonabsorbent surface. For optimum results, we recommend inks that dry by oxidation and are 100% VOC free. Keep JAZZ® Mirror Finish wrapped in mill packaging until the moment of printing. It is essential to let the paper acclimatize in the press room for a minimum of 24 hours – longer during cold weather. Also keep JAZZ® Mirror Finish covered during drying, between passes and prior to any finishing work. Pressroom conditions should be as close as possible to 68 degrees and 45-60% relative humidity. If the bindery has a different climate than the pressroom, allow the paper to acclimatize to those conditions. Low solvent (0-5%) varnish is optional as a surface protector but is not required to enhance the high-gloss quality of JAZZ® Mirror Finish. Aqueous coating can be helpful in allowing larger stack heights and further processing within 24 hours. Pre-test coatings for compatibility. Use extreme care when cutting. Use a sharp knife with minimum clamp pressure. To achieve a clean edge, back trimming is essential. Wipe the newly cut edge with a clean, soft, glycerin-saturated cloth REVERSE: JAZZ® Mirror Finish Covers have a coated backside recommended for normal printing. Use low solvent (0-5%) oil-based inks. To properly score JAZZ® Mirror Finish, start with a 2 point rounded channel score. The matrix channel should be a minimum width of 2.5 times the caliper of the sheet to be scored, plus 28/1000”. Always fold, score and bind with the grain direction. 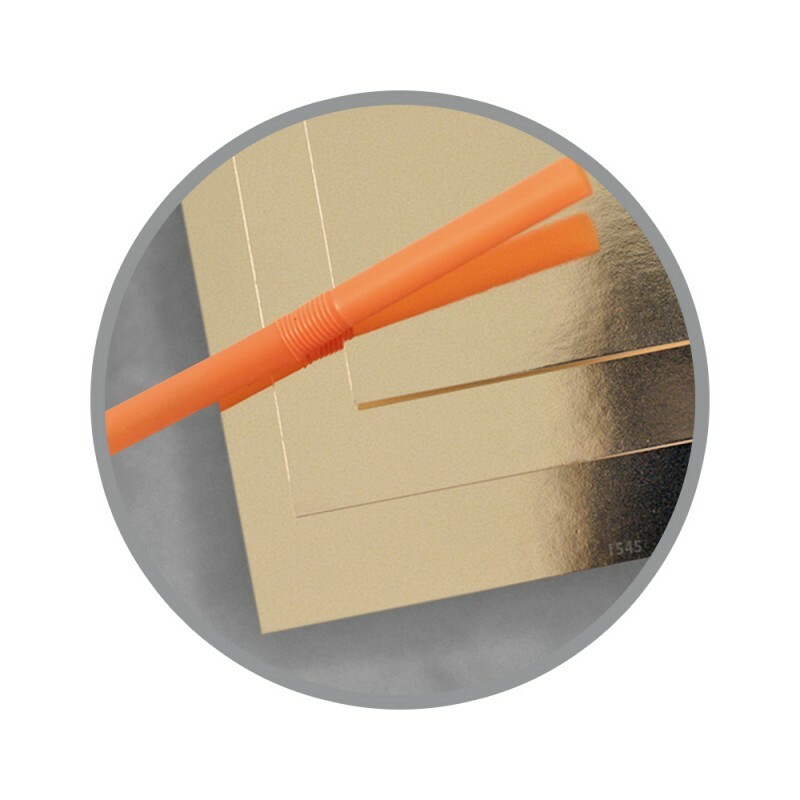 JAZZ® Mirror Finish Covers have a clear overprint varnish that can adhere to embossing dies. We recommend you use embossing film between the die and the front of the paper to improve release. Choice of foils is important, as some will work much better than others. Large foil areas are more challenging than small areas. Always pre-test to find the ideal foil, temperature and pressure for the job. Perfect for putting that elegant touch to any card. Your website - and product descriptions - were perfect for me finding just what I needed and quickly. The product arrived quickly, and was perfect!!! Thank you - I will not only use you again, but recommend you. This is a nice metallic paper, not the exact gold I was looking for and definitely not mirror (you cannot see your reflection like the picture with the straw suggests). It is very thick and will work for my project but it's not what I wanted. I would recommend this paper if you are looking for a gold metallic paper but not a mirror gold paper. Service as well as delivery time was excellent. Service was great,product is great too. What could be better? I triple mat my handpainted cards...using either silver or gold foil as my second mat. Sets the paintings off beautifully. The paper was just as you described an absolutely perfect. I was making menus for my daughters wedding the gold was the offset trim behind the dry embossed front of the menu and was stunning.